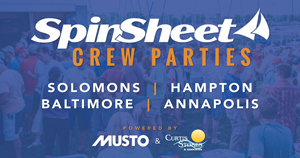 To some sailors, the term “pocket cruiser” is simply a euphemism for “small and cramped,” but for others, size, systems, and abundant accommodations simply get in the way of their enjoyment of our sport. They appreciate a versatile boat, able to get to out of the way places whether access is by land or by water. For these sailors, the Seaward 23 could be the perfect solution. Since he designed and built his first boat, the 19-foot Seaward Fox in 1976, Nick Hake of Hake Yachts (formerly Starboard Yacht Company) has remained committed to the “pocket cruiser” sailor. 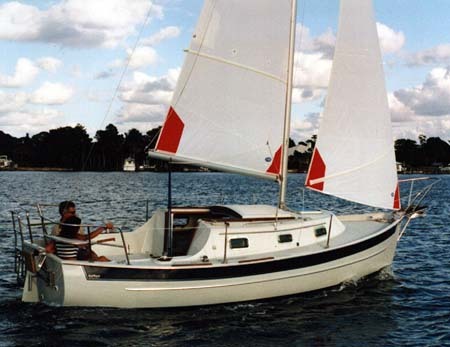 The Seaward 23, designed by Hake, was introduced in 1986 and remained in production until 2002, when it was dropped from the line, presumably because it was just too close in size to the company’s Seaward 25 model. There were only a few changes over those production years—the most notable being that early models are absent the one-and-a-half-foot-long bow pulpit found on later models. The round opening ports in the cabin side featured on early models were later replaced by rectangular ports. The Seaward 23 has a well-proportioned shape with a nearly plumb bow, an apparent but not exaggerated sweep to the sheer, a bit of classic tumblehome sectional shape at the transom, and an outboard rudder. To my eye, this is a handsome little boat. The hull is constructed of a solid layup of fiberglass cloth and resin reinforced with foam-cored stringers and a series of fiberglass liners. Seaward does not use plywood or balsa wood reinforcement in any areas. Where reinforcement is needed for stiffness, a PVC foam core is used. The result is a strong, stiff, and quite light hull. The hull and deck are joined on an outward flange with adhesive sealant and stainless steel bolts on six-inch centers. Opening ports are stainless steel rather than plastic found on most boats in this size and price range, and all deck hardware is high quality stainless steel. Standard equipment on the Seaward 23 included a tiller-steered, transom-hung rudder; although pedestal-mounted wheel steering was offered as an option and is commonly found on used models. I personally prefer the tiller in the small cockpit of this 23-footer, because it can be raised out of the way when not in use. There are welded stainless steel bow and stern rails and a life line supported by stanchions along the side deck. The bow pulpit on 1989 and newer models adds a convenient storage point and helps prevent damage to the plumb bow when raising the anchor. There is a secure bulwark around the foredeck with hawse pipes rather than chocks used to fairlead mooring lines to deck-mounted cleats. These are features more commonly found on larger boats, and they provide an added level of safety and security to the Seaward 23. Below deck, the accommodations are about the same as could be expected to be found on a 27-foot cruiser shrunk to fit into a 23-foot package. Not all are practical. For example, the“genuine privacy… for changing clothing” that Hake emphasizes is accomplished by using a solid door to separate the V-berth from the main cabin. In fact, you’d have to be a contortionist or 12-year-old in order to close the door and accomplish a change. The head is below the V-berth—not a very practical location on a “pocket cruiser” once you’ve turned in for the night. For some unknown reason, there are two sinks—one at the galley and one adjacent to the head. Only one is necessary, and the space of the forward sink could have been better used to enlarge the settee. On the plus side, there is ample sitting headroom at the port and starboard settees in the main cabin, good storage below, a table that drops down from the forward bulkhead, and a small but efficient galley next to the companionway. Standard auxiliary power was an outboard installed on a transom bracket, although a nine-hp, single cylinder Yanmar inboard diesel engine was an option often selected by original purchasers. Regular readers of these reviews may recall that I am not particularly fond of low-aspect shoal draft keels. And, with only a hair over two feet of draft, it would be difficult to find a more shoal draft fixed keel sailboat than the Seaward 23. There is no doubt windward sailing performance suffers when draft is reduced to this degree. That said, when shallow draft is a requirement, there are some benefits of low-aspect shoal draft keels. For many these will outweigh any disadvantages. Low-aspect shoal keels are certainly less prone to maintenance concerns than swing keel, keel centerboard, or water ballasted installations used to accomplish the same reduced draft and trailerability. The displacement/length ratio of the Seaward 23 is quite low at 131, and sail area/displacement ratio is moderate at 19.7. To her credit, it does not take a whole gale to get the Seaward 23 moving. And, while reaching is definitely her strong point of sail, she will sail to windward quite well if not overpowered. Generally, used Seaward 23s are slightly more expensive than similar sized models from Hunter and Catalina and less expensive than the quite similar Com-Pac 23. Recently four Seaward 23s were offered for sale at www.yachtworld.com with asking prices that ranged from $14,900 to $19,900. All listings included trailers; two were powered by inboard diesel engines, and two were outboard powered. The limited access web site www.soldboat.com recorded three recent sales ranging from $8000 for a 1991 model to $17,000 for a 2001 model. If you’re attracted to the advantages offered by trailerable sailboats, the Seaward 23 is a practical choice that is light enough to be pulled by a full size vehicle or small pickup and available with an inboard diesel engine not typical on this type of boat.